Plus Que Jamais: (More Than Ever): created in 2005. 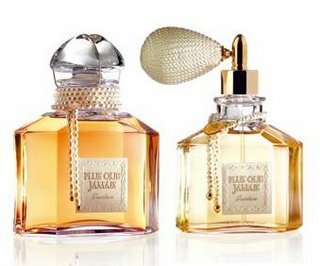 Looking to create the perfect fragrance for the re-opening of the Guerlain boutique on the Champs Elysees, Jean-Paul Guerlain composed Plus Que Jamais, an exclusive fragrance that celebrates the creative spirit of the House. The prestige edition of Plus Que Jamais was presented a 500ml quadrilobe flacon, made of Baccarat crystal. Sealed with silk and flanked by an ivory label, its neck is surrounded by a necklace of baroque pearls. The limited edition retailed at $2,600 and consisted of a 7.5 ml refillable bottle and a 490ml refill flacon of parfum. Plus Que Jamais was then available as part of the Les Parisiennes line, 125ml Eau de Parfum, and retailed for $318.